A public vote on expropriating the big landlords offers Berliners a chance to push down soaring rents. On April 6, tens of thousands of Berliners will demonstrate against soaring rents. With 85 percent of the German capital’s residents renting their homes, protests against real estate speculation and rising prices have already won broad public sympathy. Last year, 25,000 people joined a tenant-organized rally against “rent madness.” If this year´s protest will likely be of similar size, it also promises something new: campaigners are now demanding a referendum on socializing the assets of all landlords who own more than 3,000 apartments in the city. The idea of such a vote has been publicly discussed since 2018, and polls this January showed over 50 percent support for expropriating the big landlords. Unlike many other petitions filling up activists’ spam folders, the Berlin vote could ultimately lead to a law, as Germany allows for popular legislation by referendum at the state level. Even most of the conservative press has had to admit that the proposal is perfectly legal. And finance is taking it seriously: in March, rating agency Moody’s threatened to downgrade the city’s credit rating, on the understanding that socialization would deter further investment. Yet even faced with resistance from global as well as local capital, activists remain optimistic of success. If they do win, the effects will extend far beyond Berlin. Berlin has a long tradition of affordable-housing campaigns. Yet protests gained momentum over the last decade as the financial crisis and zero interest rates triggered an influx of capital into the city’s housing market. As investors tried to buy in to Berlin’s way of life, they undermined its very foundations, driving up the once-affordable rents that had allowed so much space for cafes, galleries, clubs, counterculture, and experimental living. The “wild” Berlin that visitors and natives so loved is slowly vanishing, as gentrification makes Berlin look like any other generic metropolis. In the mid-2000s tenants often complained about hipsters, students, and the Swabians arriving from Germany’s well-off southwest. No one seemed to like them colonizing the former East Berlin with their Tannenzäpfle beer and organic Bionade. If such cultural clashes provided some amusement, today they are on the wane. Today the “alternative Berlin” of artists, bohemians, and left-wingers has joined forces with the mass of working-class tenants who simply fear being priced out. The new movement is about to confront the real problem: landlords. The protests especially owe to the formation of giant, stock-market-listed real estate companies whose success counts on Berlin rents continuing to rise. In fact, the concentration of capital on the Berlin housing market is a quite recent development. While West Berlin suffered housing shortages in the 1980s, reunification eased up the market. One morning, the city woke up twice as big, while demand for housing shrank because of deindustrialization and job losses both East and West. Until the mid-2000s, rundown buildings were not renovated but demolished, and half of the over 400,000 city-owned public housing units were privatized. This was a break with the past. Public housing used to be a big thing in Berlin — indeed, both Social Democratic governments in the “red Berlin” of the 1920s and the East German socialists after 1949 believed that housing should be a public good. They invested public resources into city-owned apartment blocks with affordable rents. As soon as the Wall came down, privatization was in vogue in East Berlin: public housing now seemed to stink of socialism and “the losers.” Sell-offs gained momentum after the city-owned Berliner Bankgesellschaft bank collapsed in 2001, leaving Berliners with €6 billion of public debt. The Berliner Bankenskandal seemed to foreshadow what happened to Southern Europe after the financial crisis of 2008: debts resulting from a banking crisis where paid off by the public through harsh austerity policies. Whole public housing providers such as the GSW (with its more than 60,000 flats) were sold off, and privatization spread across Western parts of the city. GSW was sold to a hedge fund named “Cerberus” — in Greek mythology, a giant hound guarding the gates of hell. In a sad twist of history, the city government that consigned Berlin’s apartments to hell consisted of the Social Democrats and the left-wing PDS, the successor of East Germany’s ruling Socialist Unity Party today known as Die Linke. The heirs of “red Berlin” sold out their own history in the misguided belief that the city’s finances had to be “stabilized” by any means necessary. Funds like Cerberus bought up public housing companies then sold them on to stock-market-listed companies in which they held a share. Some of these latter, like Deutsche Wohnen, were almost solely formed from formerly public assets. When the financial crisis hit in 2008, a new cycle of accumulation started, as real estate appeared as a “safe haven” for those seeking profits. Investors both big and small tried to grab hold of a sector that Germans call “Betongold” — concrete gold. Zero interest rates allowing them to buy up real estate with borrowed money further boosted speculation. The “cure” for the financial crisis of 2008 became a curse for Berlin renters. The legendary 1980s Berlin squatters’ movement took over empty buildings and only later bothered to negotiate property deeds (if at all). But the new tenants’ movement learned to fight the law from within. It had to do so, because in a city pockmarked by cranes, scaffolding, and construction sites, there are no more empty buildings to take over. Knowing our legal rights has been key to recent struggles, allowing us to stand up to landlords and affect local politics. Leftists have learned a lot about zoning laws, tenancy laws, and other such rather dry matters. New initiatives show that protest is not a subcultural adventure that might get you arrested, but something you need to do to hold onto your home. Existing legislation for tenants in Berlin is quite good compared to Britain or the US: leases are usually time-unlimited and the landlord cannot terminate them unilaterally. Rent increases are limited to 15 percent each three years; tenants with old leases would thus take years to feel the pressure of recent speculation. Still, even a 15-percent hike every three years adds up, and wages have not seen any similar rise. Moreover, such limits only apply to existing contracts: newcomers often face rents two or three times as high. There also are loopholes: since 1974, upgrading apartments through renovation has allowed exceptions from the 15 percent limit. Recent environmental legislation encourages landlords to invest in insulation to save heating energy, rewarding them with the right to raise rents beyond the cap. This “energy-modernization” incentive, introduced thanks to the Greens, is today reviled among Berlin tenants. Property giant Deutsche Wohnen’s tactics using energy modernization to bypass rent limits has, indeed, mobilized many Berliners otherwise skeptical about protest, leftist politics, or anything new in general. Don’t Like the Law? Change It! Attempts to reform tenant protection at the national level have proven futile, as Angela Merkel’s grand-coalition government has proven unwilling to take action. In the capital, though, popular legislation has already begun to change things. Berlin is one of the federal republic’s sixteen states, with its own state parliament and also allows popular legislation by referendum. A two-step procedure for collecting signatures (20,000 signatures for the first step, about 175,000 for the second) can prompt a referendum; and if it meets a 25 percent turnout threshold, this vote can itself impose legislation. This has provided a useful instrument for popular politics from below. Already in 2014, a referendum halted plans to give away most of the disused Tempelhof Airfield to real estate developers. The popular vote against redeveloping the former airfield (today an improvised park) was especially remarkable given that the housing crisis was already visible five years ago. But the distrust against the (mostly private) developers was so enormous that 700,000 Berliners voted to keep their park instead. If this was a “veto” on the markets, a second referendum in 2015 tried to positively change things. This “Mietenvolksentscheid,” Berlin’s first “rent referendum,” proposed a reform of the six remaining city-owned housing providers. These agencies were not yet privatized, but had a bad reputation after driving up rents to help repay the debts from the 2001 banking scandal. The referendum campaign sought to stop these practices, to use the public agencies to build new affordable housing, and to introduce tenants’ councils to control housing providers. The proposal gained almost 50,000 signatures, but the second phase never took place. Technical errors in the proposed law’s sixty pages would have allowed the city government to tear it apart in the courts. The initiative therefore settled for a compromise: tenant councils were introduced, but without true veto powers. 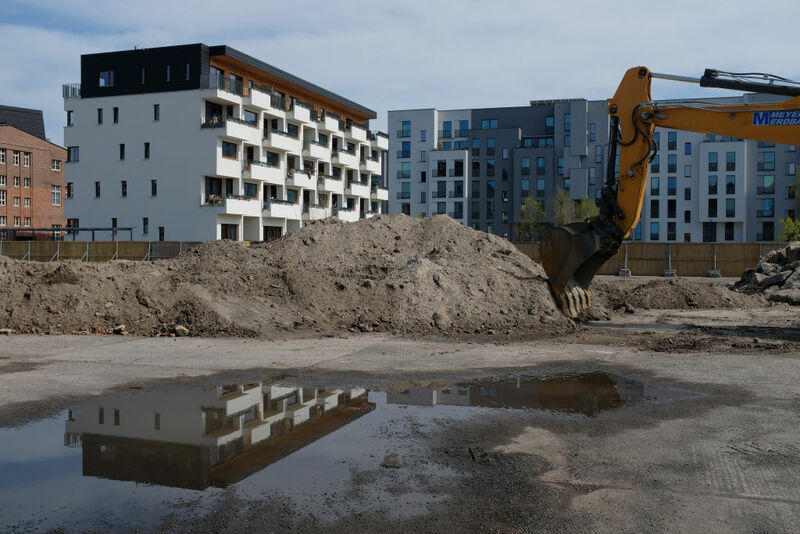 Since then, new public housing has been under construction and the city government has limited rent increases in city-owned housing to 2 percent a year; revenues from public housing agencies are also no longer used to pay public debts. The 2019 referendum takes on a much bigger adversary: instead of reforming city-owned real estate, it confronts the property giants that rule the private sector. The “Deutsche Wohnen Enteignen” (Socialize Deutsche Wohnen) initiative was created last year by activists from the 2015 campaign, left-wing groups such as Interventionistische Linke, and, most important, numerous tenants’ initiatives fighting Deutsche Wohnen. Since then, the grassroots coalition has integrated other tenants’ networks forming around corporations like Vonovia or Akelius. The fact that renters tend to organize building-by-building against individual owners or companies has often made it hard to unite a neighborhood, let alone Berlin itself, behind a set of shared demands. But the centralization of real estate capital means that large groups of people today face the same enemy. This has given rise to the self-organization of neighborhoods and attempts to adopt US-style concepts of community organizing. Indeed, a large part of the socialization campaign has been centered on helping tenants to organize against the big landlords, including through training on topics like “how to organize a neighborhood meeting” or “how to deal with the press.” Organizers, in turn, learn about tenants’ real problems. In the case of Deutsche Wohnen, activists are helped by the fact that many residents remember that their apartment used to be owned by the city. If taking these buildings back into public ownership may seem radical to outsiders, for longtime tenants it means returning to the good old days. The socialization campaign discussed in and around the various Deutsche Wohnen protest groups and tenants’ initiatives since 2017 went public last October. Its demands were not limited to Deutsche Wohnen, but rather insisted that all landlords owning over 3,000 flats within city limits should be socialized. This would mean an estimated 243,000 housing units being taken over by a new public agency, operating them on a nonprofit basis. One key demand is that this agency should be tenant-controlled rather than managed by a state bureaucracy. The campaign agrees that compensation should be paid to the former owners, but below market prices — effectively, large landlords would be forced to sell at a loss. This proposal might sound like a socialist wish list. But it comes with a sound legal backbone: Article 15 of the German Constitution. Article 15 is part of the 1949 Grundgesetz, the West German constitution that has since 1990 also applied to the former East. While it is common knowledge that the West was the capitalist part of Germany during the Cold War divide, rather less well-known are the anticapitalist sentiments that were common across Germany after liberation from Nazism in 1945. Many people linked Nazi oppression to the excessive power of private capital, especially in heavy industry. Since 1949, this article has never been used. The Wirtschaftswunder — West Germany’s “economic miracle,” triggered by the boom of the Korean War and the Marshall Plan of the 1950s — has put Germans at ease with capitalism for generations. But this love affair has been fading slowly after three decades of neoliberalism: heavy deindustrialization since 1990, and the demolition of the welfare state in the 2000s has led Germans to question the national myth of building a “social market economy.” While right-wing populists such as the Alternative für Deutschland have successfully blamed migrants for the erosion of the middle class, the political left has also gained ground — not so much in elections, but in protests around housing, against new policing measures, and for a humanitarian migration policy. Since the Federal Government never used Article 15, German states are free to enact their own legislation on socialization. Combined with the possibility of legislation by referendum, this means that the socialization campaign can appeal directly to the people — lawmakers are only involved as a second step. Technically, the referendum would result in a nonbinding resolution, which the state parliament of Berlin would then need to implement in specific legislation. If the 2015 referendum was crushed by technicalities already before the vote took place, this time campaigners have used this process to exert strong political pressure even as they work on the proposed legislation. The proposal has now galvanized the city. After initial skepticism, legal reports provided by “Deutsche Wohnen & Co. Enteignen” have been discussed and accepted among a majority of activists. Recently, the Berliner Mieterverein tenants’ union, known as a moderate body, has advised all its 170,000 members to sign in favor of the proposal. In a first wave of articles the conservative press denied the legal possibility of socialization. But it later had to accept the expert opinion provided by the Bundestag’s law department, stating that state-level socialization is indeed legal. This has put the Berlin city government under immense pressure. A coalition of Social Democrats, Greens, and Die Linke has been in charge since 2016, introducing a lighter version of austerity. Giving in to public pressure, they stopped the sell-off of public housing and started constructing new units. But it has become clear that building more public housing cannot put the lid on Pandora’s box: in fact, it would be almost impossible to build a number similar to the hundreds of thousands of units privatized already, and such construction would take years to have an effect on spiraling market rates. Only pushing back against the power of the market itself can provide a real solution for most renters. Deutsche Wohnen, born of the sins of past privatization, has become a symbol for all those landlords who abuse the housing shortage to make huge profits. Faced with this dim example, Die Linke has opted to make amends and declared its support for socialization, showing a courage the SPD has lacked. Nevertheless, the pressure of the socialization campaign has already reached beyond Berlin, as it has become a matter for nationwide talk shows. The fact that such a debate has begun before a single signature was collected is one first success of the Berlin socialization campaign. It owes to a campaign that is both radical, but also concrete and rich on legal expertise. Since the 1950s, progressive movements in (West) Germany have met with hysterical claims that “this will lead us into East-German totalitarianism.” Now that campaigners involve a principle from the constitution itself, such claims are rather more muted. If the movement taps into Germany’s particular traditions, it is also a fine example for tenant campaigns elsewhere. This also owes to its European dimension; notwithstanding its free market radicalism, EU law does not bypass older legal precedents. Of course, European bureaucrats might interpret this differently; but testing the limits of socialization in Berlin could equally have positive effects for those fighting over housing in London or Barcelona. Despite all the optimism surrounding the campaign, it will take a long struggle to make socialization a reality. Hundreds of thousands of signatures have to be collected, conservative media campaigns are already heating up, and lawsuits will follow if any legislation is passed — from the Berlin level up to the European Court. Yet this campaign is much more than a local issue. It confronts finance capital at the city level, but also challenges the right of global capital to impose its austerity regime on cities and neighborhoods. Certainly, finance is taking it seriously: the basis for Moody’s threat of downgrading the city of Berlin’s credit rating is the assumed high compensation costs for socialization. The campaign confronts global financial capital with the vision of a local economy where residents’ basic needs come first and revenues stay in the city — an active de-globalization of capital. Far from just a disadvantage, its municipal scale also helps it avoid the economic and ideological nationalism often connected with resistance to globalization. Municipalization instead of nationalization could renew the tools of the socialist left in times where the populist right seems to be suffocating any progressive critique of globalization. Ralf Hoffrogge is a historian and editor of the journal Arbeit–Bewegung–Geschichte . His recent publications include A Jewish Communist in Weimar Germany: The Life of Werner Scholem (1895–1940) and Working-Class Politics in the German Revolution: Richard Müller, the Revolutionary Shop Stewards and the Origins of the Council Movement .